Six pieces chunks of filet mignon , rice, a green salad, hummus, grilled tomato, pita bread & beef sauce. Three pieces of filet mignon beef and chicken breast, one skewer luleh, rice , a green salad, grilled tomato & pita bread. Two skewer luleh (ground beef or chicken), rice, a green salad, hummus, grilled tomato & pita bread. Six pieces of chicken breast, rice, a green salad, hummus, grilled tomato, pita bread & garlic sauce. Gyros, rice, a green salad, hummus, gyros bread & tzatziki sauce. Three pieces of filet mignon beef and chicken breast, rice, a green salad, grilled tomato, pita bread, beef & garlic sauce. Six pieces chicken breast, one skewer luleh, rice , a green salad, grilled tomato & pita bread. one skewer wiled white mahi fish, rice, a green salad, hummus, grilled tomato, pita bread & fish sauce. Five pieces lamb tenders charbroiled with bell pepper and onions, rice , a green salad, hummus, grilled tomato , pita bread & tzatziki sauce. Eight pieces of our special homemade fried chicken wings, French fries, hot sauce, ranch & ketchup on the side. Three falafels and three grape leaves, rice, hummus, tabouleh , a green salad, pita bread & tahini sauce. Six falafels, rice, salad, hummus, pita bread & tahini sauce. Four pieces chunks of filet mignon , rice, a green salad, hummus, pita bread & beef sauce. One skewer luleh (ground beef or chicken), rice, a green salad, hummus & pita bread. Four pieces chunks of chicken , rice, a green salad, hummus, pita bread & garlic sauce. Grilled chicken breast, salad, rice & pita bread. Gyro meat, rice, salad, gyro bread & tzatziki sauce. Gyros, fries, gyros bread, tzatziki & ketchup. Four strips of chicken, fries, pita bread, ranch & ketchup. Two falafels and two grape leaves, rice or green salad, tabouleh, pita bread & tahini sauce. Four falafels, hummus & pita bread. Three falafel, hummus, tomato , lettuce & tahini sauce. Served with salad or fries. Chicken breast, tomato, green pepper, onion with parsley, mixed lettuce & garlic sauce, served with green salad or fries. Beef flap meat, tomato, onion with parsley, green pepper, mixed lettuce & beef sauce. Served with green salad or fries. Luleh (beef or chicken), tomato, green pepper, onion with parsley & mixed lettuce or fries. Romaine lettuce with homemade pita chips, Parmesan cheese, chicken, tomato, cucumber topped with homemade Caesar dressing. Mixed lettuce, tomato, cucumber, bell pepper, onion, olives, feta cheese, pita chips, & chicken. Served with Greek dressing on the side. Mixed lettuce, tomato, cucumber, drizzled in Greek dressing, feta cheese, gyros, Served with pita bread & tzatziki sauce on the side. Mixed Lettuce, tomato, cucumber, drizzled in ranch dressing, turkey, feta & Swiss cheese. Mixed Lettuce, tomato, cucumber, drizzled in ranch dressing, chicken, pita chips & feta cheese. Mixed Lettuce, tomato, cucumber, drizzled with Greek dressing, feta cheese, four falafels, pita bread & tahini sauce on the side. Mixed lettuce, tomato, cucumber, feta cheese, & Greek dressing on the side. Grounded garbanzo beans, onion, parsley, garlic & various spices. Dep of roasted eggplant blended with garlic, lemon juice, olive oil and tahini sauce. Hand chopped parsley, tomato, onions and cracked wheat topped with lemon juice and olive oil. Cooked, mashed garbanzo beans, blended with tahini , garlic, lemon juice, olive oil. Yogurt dip containing cucumber, garlic with seven different fresh herbs. Spinach tortilla, rice, hummus, tomato, tabbouleh, mixed lettuce & special sauce. Flour tortilla, hummus, rice, tomato, cucumber, green pepper, olives, mixed lettuce, feta cheese & special sauce. Tomato & basil tortilla, rice, hummus, tomato, cucumber, bell pepper, olives, mixed lettuce & special hot sauce. 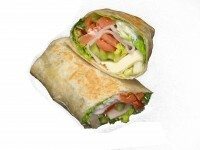 Flour tortilla, turkey breast, tomato, cucumber, olives, green pepper, swish cheese, mixed lettuce & special sauce. gyros, tomato, lettuce & choice of onion, tzatziki sauce. Served with salad or fries. Copyright © Mediterranean Delight 2016. All Rights Reserved.